Economic Interests | If you owe the bank £100, that's your problem. If you owe the bank £100 million, that's the banks problem. If you owe the bank £100, that's your problem. If you owe the bank £100 million, that's the banks problem. The new Bank of England Governor, Mark Carney, has shown impeccable timing. He leaves Canada in the best shape of the G7 members, boasting GDP at least 5% higher since the crisis began compared to Britain, where GDP has still yet to catch up to its previous peak. But he also leaves the country with some long term problems that he won’t have to deal with. Canada is facing a rising debt problem as more and more consumers are borrowing money they don’t have. This is compounded by Mr Carneys low interest rates, which are needed to boost growth but are now encouraging reckless borrowing. Growth is also slowing this year, with the Canadian central bank now cutting projection for the next few years. As this graph shows, Britain is experiencing a worryingly slow recovery compared to previous years, with GDP still somewhat below the 2008 peak. In contrast he arrives in the UK at a possible turning point. After five years of a deep recession followed by a failed recovery, the statistics are now finally pointing to better times. Manufacturing and construction are growing, consumer confidence is improving and new schemes to help boost lending and property buying seem to be working. GDP is set to grow at around 1% this year if the economy stays on track and unemployment is staying low compared to the rest of Europe. Yet there is an underlying problem in Britain’s economy that will prove hard to fix for the new Governor. The average wage in the UK has declined by 5.5% since mid 2010 when adjusted for inflation, falling further than some of the worse off countries in the EU like Spain. This won’t surprise Britons, where the cost of living is squeezing the incomes of many households. As wages have remain restricted since the recession by companies that can either not afford the higher costs or are simply taking advantage of the desperate workforce, inflation has been increasing at between 2-4% a year. This can particularly be seen in the steep rises of energy bills, which have more than doubled in the period from 2004 to 2011. More price rises are set to happen in the future too, with some energy companies suggesting bills will be £100 more than government projections state for 2020. Even the new positive growth numbers hide this problem. Instead of salary rises, people are turning to borrowing again to supplement their income. Personal debt has increased by £4 billion in the last year and is worryingly becoming a necessity for families to keep up current costs, along with benefits. If growth recorded in the first quarter at 0.3% had been based on wages, it would have fallen by more than 1% and pushed Britain into recession. A real recovery will need wage growth to create real growth. Otherwise a debt inspired recovery could see interest rates start to rise, leading to costlier interest payments on the debt held by consumers, leading to more defaults and another market crash. A worrying trend is that of the zero hour contracts, where companies do not have to stipulate what hours an employee is working each week. Additionally, they don’t have to provide the employment benefits that full time employees receive like sick pay and maternity leave. Regulation is lighter in such work places and offers no real job protection, leaving the employees less likely to spend freely if they don’t have a consistent salary or job. This can only harm the economy’s recovery at a fragile time. Yet there are some positives. Unemployment has stayed relatively low in the UK since the recession because of the countries flexible labour market. Instead of industry wide lay-offs, companies were able to lower salaries to keep people employed. This was healthy, as employees on low wages were better than the unemployed claiming benefits. But with the economy now trying to recover, there is no longer that fear of a market crash to hold companies back from increasing wages. The problem is that while consumer have been able to borrow money freely, companies are finding it a much harder task, especially the smaller and medium sized firms that employ the majority of the population. Banks, the biggest lenders to businesses, are focusing on building up their capital for new regulations, meaning they are averse to lending money to companies that don’t have the size and market share to guarantee their loans. There is a lack of a genuine back up to the banks for smaller companies, in contrast to the bigger companies that can lend from the international markets for affordable rates. This is restricting both current companies struggling to grow and new ones trying to enter the market. This affects the public, as investment improves productivity which tends to influence higher wages. Right now business investment is down by a third since the recession, productivity has declined despite more people being in work and real wages have therefore fallen. 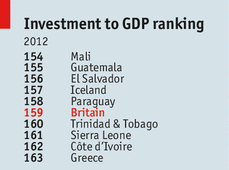 Astonishingly, the UK ranks 159th in the world for its investment to GDP ratio. The solution is therefore to improve the market for lending to small and medium businesses. This is easier said than done. Banks are still a long way off from their pre-recession lending rates; especially with two of the biggest banks still part owned by the government. People are wary to see banks go back to that sort of lending anyway, with bankers lending recklessly and risking too much money. But a middle ground must be found to provide capital to the rest of the market. Different lenders must be found as well; in America banks share a much a lower percentage of the lending market than in the UK and Europe, one example of why America has outperformed both since the recession. One such example is peer-to-peer leaning, where the two largest providers in the USA lent over $1.7 billion in the last five years. One recent improvement has been the “Funding for Lending” scheme which gives incentives to banks to lend by offering money that can only be used to lend to businesses. Britain is further ahead than the rest of Europe in solving this problem and is thinking outside the box to improve the economies main weakness. If lending can pick up and even better without having to rely solely on the biggest banks, then investment can pick up and wages could start to grow. It’s not the recession but how the country recovers that will come to define Britain. Democracy has never been so popular. The Arab summer saw dictatorships overthrown and replaced with democratic intentions while in Africa the percentage of democratic countries has increased from 7% in 1990 to nearly 40% last year. The two giants in South America; Brazil and Argentina, have even managed to elect female leaders, something the USA has still yet to achieve. In the world as a whole, democracies roughly account for 60% of the world’s 196 countries, nearly doubling in the last two decades. So the public should be happy right? Wrong. The definition of a democracy is vague and the differences between elections in one continent to the next can be staggering. Some “democratic” countries are rather misleading as well; for example Hugo Chavez won consecutive elections, but was an autocratic dictator in all but name, widely considered to have rigged elections and bought votes. Russia as well holds elections, but the chances of President Putin losing an election are slim to none, with the Kremlin wielding a tight fist over the polling system. That lowers the level of truly democratic countries to a less impressive 25% according to some statistics. The Financial Times graph shows the election results that awarded the presidency to Vladimir Putin were controversial to say the least. Even those countries are now facing troubles. The global recession sprouted protest movements like “Occupy Wall Street” and started a trend that has culminated in the widespread trouble many countries are now experiencing. Brazil angered their people by overspending on the world cup, which has vastly trumped the costs for the South African World Cup, while neglecting the public services that will be so key to the a successful tournament. Turkey’s suppressive leader, Prime Minister Erdogan, has pushed his people too far, putting into law tight rules on alcohol and arresting journalists at a higher rate than that of China. Egypt meanwhile democratically elected the Muslim Brotherhoods front man Mohammed Morsi, who promptly handed himself dictator like powers and refused to listen to the secular opposition. The world cup stadiums have come at too high a cost for most Brazilians, when the quality of living is nowhere near to that of the stadiums. In the last two examples there can be seen a link, with both the Turkish and Egyptian leaders exploiting the lack of important institutions and constitutions to grant themselves greater control of the country. Winning majorities in the elections seemed to suggest a remit to do as they liked, without consulting the public, especially the percentage that didn’t vote for them. It’s not a coincidence that Brazil has seen the least hostile protests, with President Dilma Rousseff agreeing with the public’s right to peaceful protests (while quite rightly criticizing the small minority that turned violent). Yet even the Western countries with stable democracies have seen unrest. Southern Europeans have become frustrated with the levels of austerity being enforced upon them by Brussels and Berlin. Greece has been the main recipient, but even the likes of France are starting to feel the tension, with the approval rating of President Hollande diving to a lowly 24%. Britain suffered more in 2011, when riots in London spread across the country and caused national panic. Though the origin was most likely the austerity the coalition was embracing to cut Britain’s large budget deficit, racial tensions were a common thread, with the London Met still dominated by the white British (around 80%) in a city where that is now considered a minority. The British riots caused major panic, as some feared the country was spiraling out of control. The USA however managed to largely bypass these protests, mainly by keeping up their spending levels and kicking the austerity can down the road. Only this year has Barack Obama actually looked to cut down the trillion dollar deficit he had been running consecutively in his first term, with the automatic sequester cutting budgets by $85 billion in 2013. Yet democracy hasn’t looked too rosy for the USA either. The deadlock between the president and congress has become a serious problem, with a polarised government failing to put policies through. A small tightening of the gun laws this year was rejected by the republican dominated congress mostly out of spite, while a recent farming bill (consisting of subsidies for farmers and food stamps) was rejected for the second year running despite holding policies both sides have traditionally liked. Even worse, both sides nearly forced each other to walk off the fiscal cliff at the start of the year, with the president reluctant to cut spending and the congress incessant on not raising taxes. Luckily both sides managed to reach a bipartisan agreement, though if anything this has emboldened both parties beliefs that their way is the only way. The inability to agree with the more popular President Obama has seen Congress’s approval rating fall sharply to record lows. In the last 5 years democracy has taken a bashing, that much is easy to see. For every success like Myanmar, there is a monumental failure like Syria to counter balance it. Yet, many countries still strive for the democracy that the west has enfamed. Giving the public the ability to choose its leaders is a right many in the west take for granted, but something many societies go without. The protests are simply another form of democracy, giving a voice to a cause that the government might be ignoring or missing. In the three biggest protests right now, you can rank Brazil as the most democratic and Egypt as the least. 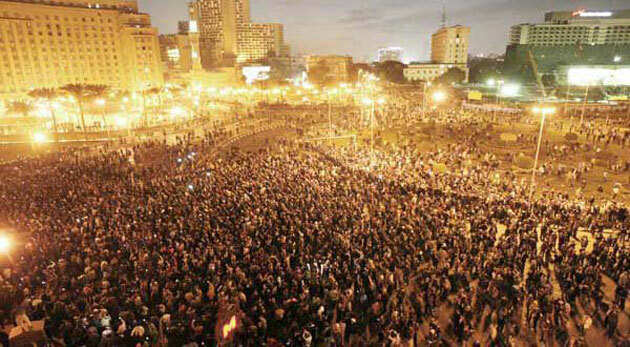 Egypt could have stopped the protests that started last year by listening to the public and engaging them, rather than trying to stamp them down. Turkey started off in a similar vein, but has now tried negotiating with the protesters, especially with the Kurds, who threatened to take the protests to another scale. Brazil however, have largely allowed the protests to take place, and allowing for some violent episodes have seen the least chaos. The government is also opening up a dialogue with the protesters, agreeing to some of their demands for increased funding to the public services. The country still has a long way to go, and could have foreseen the public out roar that was building, but have so far acted in the most democratic fashion. The protests might be shocking to see, but they are easily trumped by the actions of say the Chinese government in Tiananmen Square, or the conditions of the North Korean people who are denied any access to the outside world. Such dictatorship allows for such short term protests to be stamped down on quickly, but encourages longer term distrust and anger toward the controlling governments. The answer for the countries facing public unrest is for more democracy not less. Allowing the public to voice its frustrations can let off steam and negate anger building up and people acting out in frustration. In the USA’s situation, more democratic bipartisan talks between the two parties would result in much higher success rate for important policies. The immigration reform coming through shows signs of this much needed bipartisan agreement, but party politics could still derail negotiations. It must be remembered that there are much worse scenario’s than the current protests hitting democracy. As Winston Churchill famously said “It has been said that democracy is the worst form of government except all the others that have been tried”. The Euro Crisis has died down in 2013 after a turbulent 2012. This was not because of a lack of effort by Europe’s trouble makers; Italy ground to a halt when trying to decide a government, while Cyrpus were the latest government to need a bailout. Yet the cost of borrowing for many EU countries has been decreasing gradually regardless. This has mainly been down to the statement made last year by the head of the European Central Bank to “do whatever it takes” to save the euro, hinting at the bank finally becoming a lender of last resort to the rest of the eurozone. But tricky times lie ahead for Europe. The Euro area declined on averaged by 1% in the first quarter of the year and unemployment has reached a record 12.1%. Protests and riots have been more common in recent years (with even Sweden now experiencing public unrest) leading to many extreme parties getting more public attention, campaigning largely on their respective countries leaving the EU. So a big question remains; who will be the next country to request a bailout? One likely candidate is Slovenia. With a budget deficit over 5% of their GDP, their finances are in disarray. The economy retracted by over 15% in 2008/09 and is not set to return to growth until at least 2015. The largely state owned banking sector, saddled with debt, has grown to 140% of GDP, with an estimated 20% of loans considered non-performing (extremely late repayments). The public debt is still rather low at around 60% of GDP compared to much of Europe, but the interest levels Slovenia have to pay for borrowing are rather high at near 6%, if that rises much higher in the coming months they may lose access to the international markets and require external help (i.e. a bailout). Much of Slovenia’s problems come down to the credit crunch, where easy credit fuelled a construction boom similar to that in Spain that promptly burst. Another problem was the size of the state, which kept a tight grip on the bigger markets, crowding out private competition and stopping innovation. With the government now employing austerity measures, the growth of these industries have stalled, with potential buyers now a lot harder to find in a recession hit EU. Slovenia’s prime minister has announced a brave rejection of any bailout talks, instead talking of important reforms to the banking sector (a creation of a bad bank for the worst debts) and budget balancing austerity measures including: cuts to school subsidies, a recent 5% cut in nominal public sector wages and a new higher marginal personal income tax. Their crisis resembles more Ireland’s than Cyprus and some strong leadership is giving the country a fighting chance of avoiding an international bailout. So if not Slovenia, who then? Two countries that resemble Cyprus (the latest bailout victim) more closely are Malta and Luxembourg. Both are small countries with massively outsized banking sectors. Malta’s banking sector is nearly 800% of its GDP making it impossible for the government to bailout out the sector by itself if needed, while the government already has high public debt of around 70% of GDP. But Malta has relatively low unemployment and a controllable budget. Its banking sector is rather different in nature to Cyprus’s as well; instead of two big local banks full of dodgy russian money and heavily exposed to the volatile Greek economy, Malta banks are actually subsidiaries of foreign banks, with high capital ratios and profits. Luxembourg also has a large banking sector, roughly 23 times its GDP. But once again the banks are large foreign owned, differentiating it from Cyprus. The economy is also very strong; experiencing low growth in 2012 when the surrounding countries were in deep recession, holding low public debt and unemployment and possessing one of the large current account surpluses in the region. If that weren’t enough, the small country has the highest GDP per capita ratio in Europe, meaning its people enjoy a very high standard of living. Both countries are over reliant upon their financial sectors and are very exposed to shocks in the market, but neither are realistically on the brink of a bailout. Rather more worryingly, a much bigger economy is at risk, one which has already had to accept a bailout for its banking sector. Spain withdrew around €40 billion from European Stability Mechanism to help recapitalize their banks (a EU organism set up to offer up to €100 billion in bailout funds to member states). Yet many believe this wasn’t enough and that problems remain in the troubled Spanish banking system. Spain has had to nationalise one of its largest banks Bankia, while most others have had to make large cuts to their balance sheets. If this wasn’t enough, the economy is in serious trouble. Spaniards are seeing a deep decline in their national output, likely to fall for an eighth consecutive quarter and unlikely to see growth until after 2015. Unemployment is at a record high of 27% of the population, nearly 60% for the young. The budget remains heavily unbalanced, with a deficit of 7% of GDP, leaving public debt high (though not as high as private debt). A construction crash has lost many young spaniard an entry into the work force and has caused a lot of bad debts in the banking sector. 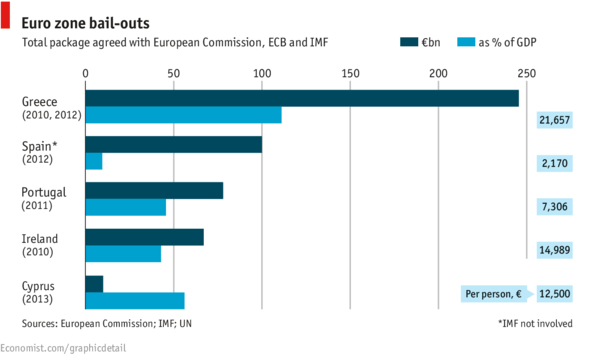 When times were bad for the EU, Spain and Italy have faced some of the highest borrowing costs. Many see Spain as the weakest member of the big club, and any serious bailout of the economy would cause massive fractures in the EU and could possibly cause a domino effect on the likes of Italy and so forth. Fortunately, the political scene is stable, with the government in power for the foreseeable future and elected on a mandate of budget balancing and reform. Such reforms and austerity are already under way, with labours cost having dropped in contrast to rises in Frances and Germanys and a 4% drop having been achieved in the budget deficit since 2009. Progress is being made, but it needs a stable environment and a strong recovery in europe wide demand for Spain to really recover and see of the need for a bailout. That is a big ask in a continent that has become synonymous with the word crisis. A bailout for Spain is largely not talked of, precisely because of the implications it could have for the future of the EU. Yet it probably remains more likely than a bailout for Luxembourg and Malta. The reality is that many member states could require a bailout if matters turned for the worst, with Portugal another possibility after the rejection of austerity measures by the national courts. The lack of a proper system in place and the reluctance by the ECB to really put its money wheres it mouth is, means rich and stable countries like Germany will continue to fund the mistakes of poorer economies. A more united Europe could solve this, with the spreading of some of the debt between the member states an attractive idea, ending the vicious circle of national debts being inflated by bailouts and increasing the need for further bailouts. Politically it remains a tough sell, especially for Germany, but it would also show a strong and united Europe, something most national leaders would secretly like to see. Slovenia are the strongest possibility for a next bailout, with markets lacking confidence in the economy and increasing the costs of borrowing to perhaps unstable levels. But a spreading of at least some of the debt through Euro Bonds could greatly decrease the need for this guessing game. If investors had taken a punt on the Japanese stock market six months ago, they could have seen the value of their shares go up by 70%. This was roughly about the same time that Mr Sinzo Abe, the new Prime Minister, was likely to lead the country once again. He was originally in office in 2006, before resigning within a year after a combination of poor health and low popularity. The second time round has been much more of a success, with opinion polls showing a 74% approval rating in April. It’s not hard to believe; GDP growth was up at an annualised rate of 3.5% in the first quarter, far above the likes of the USA, Britain and the eurozone (which is currently fighting recession across the region). While the yen has dropped 20% in value against the dollar, boosting Japans struggling exports that have long had to live with a strong currency making their products uncompetitive. Toyota for example are expecting net profits to increase by 40% this year. Much of this is down to a massive stimulus package that Mr Abe publicized in January of ¥10.3 trillion. Earmarked to improve the infrastructure of the country and boost confidence, it is in stark contrast to the policies of America and Europe, where austerity rules the roost. Coupled with this, the Central Bank of Japan’s reigns was handed to Haruhiko Kuroda, a willing experimentalist and ally of Mr Abe. He promptly announced an inflation target of 2% (after years of deflation) to be met in the next two years, a confident claim that could prove difficult. But then that could be missing the point; it’s not about reaching the target per se, it’s about inspiring confidence to the nation and changing the atmosphere of gloom that has enveloped the country. Additionally, Mr Kuroda has committed the central bank to buying up ¥7.5 trillion in long term government bonds a month, roughly equating for 70% of the Japanese bond market. Finally he announced the institution would become the only major central bank to change its target from inflation rates to a monetary base system – the amount of money pumped into the economy. 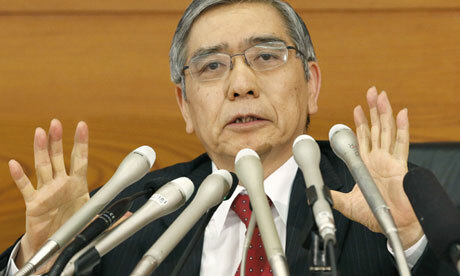 The new governor of the bank of Japan, Haruhiko Kuroda, is taking a gamble on the economy. Yet there are repercussions to Abenomics. Japan is already struggling with a mass of debt on its shoulders, at over ¥1,000 trillion and set to reach 240% of GDP next year. That is by far the highest debt to GDP level in the world, while in numerical terms it is only second to America, whose economy is three times that of Japans. It is also 20 times that of current government revenue and takes up half of said revenue to service it. One solution is the expected increase of consumption tax to 8% in April next year and 10% in 2015, which was set to help achieve the lofty aims of halving the primary budget deficit by 2015 to 3.2% of GDP. The fiscal stimulus has thrown this ambition out the window, with the budget deficit now believed to have increased to 8.8% of GDP this year. Adding more debt to the pile looks risky, though the actual chance of a debt crisis is low; Japan plays very little for the money it borrows mainly because the bond market is dominated by local Japanese savers and the central bank. But this is clearly a gamble by Mr Abe, a last throw of the dice, to succeed (increase growth and revenues and start to cut into the debt pile) or fail (increase the level of debt and see the economy spiral out of control). A graph showing the increasing rise in Japans debt over the last two decades. To only make matters worse, Mr Abe has inherited difficult long term problems. The first is the current energy crisis. Following the Fukushima nuclear meltdown, Japan drastically shut down the majority of its other reactors, leaving it to rely on importing energy, a costly measure. Nuclear energy accounted for 30% of the sector and was set to increase to 50% in the next two decades to account for a rising demand for energy. Mr Abe and his government are now struggling to make up for that shortfall in a resource low nation, with the possibility of electricity cuts not being discarded and a U-turn on nuclear power very unpopular. The imbalance could also push the narrow current account margin (currently 1% of GDP) into the negative, adding further strain to the budget deficit and public debt. Only a few Nuclear stations are still online in Japan, causing an energy shortage in the country. The second long term problem is the demography issue. There are a growing number of elderly residents in Japan that will drain the states resources in the form of pensions, health care etc. In the next 90 years, the percentage of the population past retirement will grow from one fifth to nearly half. A rapidly declining birth rate coupled with a trend for smaller families means the number of pensioners living on their own will double by 2030 based on 2005’s population numbers. While the number of available workers is shrinking, resulting in less people contributing to the economy and more people taking state handouts. This may be a global problem in the rich world, with the average age of death continually rising, but Japan is a standout indicator predicted to experience the worse of the problems. 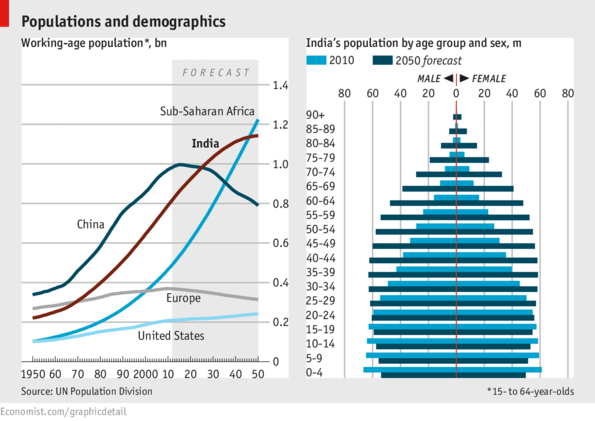 In contrast India’s population is getting younger and will boast a 250 million increase in its working age population over the next decade. Encouragingly, Mr Abe is also striving for economic reform. He is set to release his reform policy next month which is expected to include; steps to make it easier for female participation in the workforce and a deregulation and breaking up of the energy sector. More ambitious aims could include: easing barriers to investment in the farming sector, freeing up Japans rigid labour laws and increasing visa access. Though these could be held up until after the July elections for the upper house which if his Liberal Democrat party were to win a majority in (which seems likely), Mr Abe could pass legislation without hassle, a rarity in modern Japan. Joining the TPP (Trans-Pacific Partnership) would prove an important step as well, by expanding trade with some of Japans most important trade partners and providing a timely boost to GDP growth. Entering the discussions so soon was warned against by his advisers, but it has only seemed to have improved his image further, giving him foreign credibility and respect. Going head to head against the lobbyists for protectionism will be tough, but opening up its economy is one of the few major moves Mr Abe can play to increase long-term growth. Increasing trade with the USA via the TPP could be a massive boost to Japan’s economy. Disappointingly, Japan has increasingly become isolated economically, not attracting much foreign direct investment due to high taxes (with a corporation tax of 38%) and a society reluctant to integrate with foreigners. If Japan is to avoid a future disaster it will have to really embrace globalisation. Immigration could be a real solution to their ageing population, as immigrants tend to be both younger and embrace bigger families, as shown in the USA. Attracting foreign investment is also key, as the government cannot hope to keep up its stimulus package in the long term and will need the private sector to invest much more than it currently does. Japanese firms could be forced into growth strategies if their sectors were fully opened up to global competition. Only then could the government start to reproach – as it will certainly have to at one point – and start to cut the government spending and lower the public debt levels. A return to growth for the world’s third largest economy, one that is equal to France’s, Italy’s and Spain’s combined, is a feat to celebrate. But if Mr Abe doesn’t implement the long term reforms and embrace globalisation, then he might find (both metaphorically and literally) the economy running out of energy. Thatcherism: One foot in the grave? On the 8th April, Britain said goodbye to their first female Prime Minister, arguably the most famous one since Winston Churchill. The reaction has been mixed to say the least, with Baroness Thatcher a bit like marmite; you either love her or hate her. On the positive side; she ended the trade unions grip on the country, reduced the high inflation rate, created a free market approach and helped retain Britain’s global influence at a time when other super powers were rising to the top. On the other hand, she helped divide the country even further, centralised power in Westminster, reduced public investment in infrastructure and hardly made a dent in the issue of equality. She also made a lot of enemies, in particular the mining industry, civil right activists and even her own party (who still suffer under her shadow). But no matter what you think of her personally, her economy policies have had a lasting effect on the nation and the world as a whole. Her following loosely of the ideas of Friedrich Hayek was extremely brave when the rest of the world was dominated by Maynard Keynes ideas. The idea in general was to shrink the state and its effect on the country, thereby allowing the private sector to grow. When governments enter the markets they tend to crowd out private enterprises and mange sectors poorly, so Baroness Thatcher privatised big industries in transport and energy and eliminated state controls. This improved productivity in the nation and set off a trend of privatisation throughout Europe and the wider world. Germany fully privatised its national champion Volkswagen in 1988 while even France, a country that never fully caught on to privatisation, sold off shares in Renault in 1996 (though it still holds a 15% ownership to this day). In Eastern Europe and Latin America, privatisation became extremely popular, as it encouraged outward investment into the country that the governments couldn’t hope to create by themselves. In Poland between 1990 and 2004, 5,511 public owned enterprises were privatised, while Latin America keenly accounted for 55% of global privatisation in the 1990’s. Annual revenues from global privatisation as a whole peaked in 1998 at over $100 billion, showing the extent to which “Thatcherism” had an effect on the whole world in the aftermath of her term in office. France privatized Renault, though they still hold a 15% stake. Yet times do appear to be changing. The world-wide recession (a caveat of the free market economy Margaret Thatcher brought in) forced many governments to resume ownership of previously private industries, especially the banking sector. The UK government partly nationalised RBS in 2008 and now owns a majority 81% stake, Holland recently nationalised bank and insurance group SNS Reaal for €10 billion, Belgium nationalised their big bank Dexia in 2011 while Spain had to request almost €40 billion in bailout funds for its four nationalised banks late last year; Bankia, Catalunya Banc, Banco Gallego and NCG Banco. This isn’t all, in South America, a region so keen on privatisation, the trend is also reversing. Argentina last year took a majority 51% stake in YPF (an oil company) without giving its parent company Repsol (a Spanish Company which held 75% of YPF) a cent. YPF aren’t alone, Ms Fernandez (Argentina’s President) also nationalised their private pension funds and a large airline, with the latter flagging (44% of Aerolíneas Argentina’s flights were not running on time last year). If it weren’t enough for Spain to lose YPF, they also lost another company to a South American President. Evo Morales, President of Bolivia, nationalised their national power grid company of which a majority was owned by a Spanish company. Mr Morales has at least in the past offered remuneration, though often it has been below free market levels. Finally there is Venezuela, who suffered their own loss of a famous leader, Hugo Chavez. The dominant leader was beloved by his public and encouraged national patriotism by nationalising large parts of the economy. But this is possibly the worst example of nationalisation. 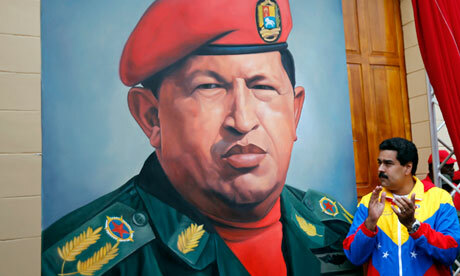 Mr Chavez employed only those loyal to him in powerful state positions, rather than those best for the job. He gave cash handouts to the population but has had one of the worst records in the region for lifting people out of poverty. Margaret Thatcher was a willing accomplice to globalisation, which has seen trade explode between nations and barriers broken down. So she would be sad to see that the WTO has cuts projections for trade this year down from 4.5% to 3.3% due to increased squabbling over trade restrictions, while protectionist policies in some studies have been suggested to have increased by 36% in 2010/11. The financial crisis’s long lasting consequence has been the setback in the expansion of integration within the world, with countries now moving towards protectionist policies more and more. In the recent EU budget talks for example, one of the few areas not to be discussed were Frances protected agriculture subsidies (where tariffs on non-EU goods have known to reach 156%). Then there was the decision by Brazilian President Dilma Rousseff to increase Industrialised products tax by 30% in 2011 for vehicles where 65% of the value added did not originate in Brazil, despite breaking WTO rules. More worryingly, the biggest trade zone right now is facing big doubts over its future. The EU is the biggest backer of free trade in the world, so if it were to break up, it would set the world back years. The lack of tariffs and trade caps between EU nations majorly simplifies the whole process, reducing the red tape that clogs up businesses and increasing the number of options open to the consumer. The percentage of trade in EU states between each other is falling sadly, with Germanys decreasing by nearly 10% since before the financial crisis (though there are other contributing factors). The single market also bizarrely does not include services, which account for around 71% of EU GDP but only 3.2% of intra-EU trade. Thatcherism however is hardly dead. Free trade deals that many thought were long gone are starting to pop up once again. The EU and USA are discussing a “transatlantic trade and investment partnership”, which could according to some estimates boost GDP in both regions by between 0.5-1% to perhaps even triple that, depending on the amount of restrictions reduced. Tariffs only average about 3% between the regions, but other barriers to trade are aplenty and go a long way to restricting trade. Additionally there are the Trans-Pacific Partnership talks between the North American and South East Asian regions. The aim is to cut trade restrictions between 11 nations, including; USA, Mexico, Canada, Japan, South Korea, Vietnam and Australia. The countries involved account for around 30% of global trade and could improve the economies GDP’s by an estimated 1%. Neither deal is even close to being finished, but they both bring hope to the idea of free trade that Margaret Thatcher helped popularise in the 1980’s. After the global recession, many criticised the free market approach as the main cause for the financial crisis, but the easy excuse isn’t always the right one. A free market doesn’t have to result in a lack of regulation and poor preparation, which were the real causes for the banking crash. A balance is needed for it to work, free market policies used along with guidance (not interference) from the state. Baroness Thatcher may have passed on, but her free market policies are still alive and kicking. Is the EU being dragged apart? After a sense of calm had finally emerged in the eurozone since last summer, panic has erupted once again. Cyprus’s long awaited bailout was carried out with little thought of the consequences, both short term and long. The initial decision to place a one off tax on all depositors in Cypriot banks, both over and under €100,000, was always going to lead to public uproar and a bank run. The second bailout decision was slightly better, only affecting those with over €100,000 in their banks accounts and winding down one of Cyprus’s biggest banks, the Laiki bank, while switching accounts to the Bank of Cyprus. But the damage had already been done; the government now has to enforce capital controls to keep money in the country, while the public won’t forget how close it came to them losing chunks of their bank balance. It has almost certainly ruined one of Cyprus’s biggest sources of income as an offshore financial haven, with the conditions of the bailout most likely requiring reforms of the country’s economy. Then there is the tourism sector (another big market) which will be hit, as foreigners won’t want to risk getting caught in the middle of another financial crisis. Worst of all, this will not be the end of it; the economy is set to retract by 5% in the more positive estimates and another bailout will need to be negotiated. Yet this is not the biggest worry for the European Union. Cyprus accounts for a tiny 0.2% of Eurozone GDP, its bailout at €10 billion is minuscule compared to the €246 billion needed to bailout Greece. If the economy crashed and defaulted on its debt, it would hardly tear the European Union apart. The bigger repercussions of this debacle are that the EU looks as divided as ever. The capital controls being placed on the Cypriot economy are not supposed to be possible in the EU – they are the first case of it since its creation. They are supposed to be short term, but then the same was said about Iceland 4 years ago. Even more worrying is that the much heralded banking union that the EU nations announced last year now seems less likely. The European Central Bank was set to bail out troubled banks directly, thereby cutting off the self-defeating link between weak banks and weak governments. But to some member countries that seemed too much like gifting money without conditions that have so far been ever present within bailouts e.g. reforms to the economy. Cyprus was the big test, to see if the ECB would directly fund the failing banks of the island, but disappointingly this was not to be the case. A banking union would have showed a more unified EU, with member countries prepared to provide assistance to troubled states. It could have possibly paved the way for joint government bonds, stopping the inconsistent borrowing costs that have spread throughout the eurozone. In reality the EU members have been diverging for awhile, amplifying the problems of the union. Looking across the region, this isn’t the only sign of a gap emerging between EU states. Tensions are rising within the union, with the periphery nations growing resentful over the austerity policies being enforced onto their economies, while the central nations are becoming frustrated at having to rescue the weaker nations from their own mistakes. This is showing in the form of protest votes. Greece had a near miss in their latest election, where a party campaigning on leaving the euro ran the victors close. Italy went a step further, with the 5 Star Movement (a protest party lead by an ex-comedian) caused a political gridlock in the March elections which has yet to be resolved. This was helped by the far right being led by Silvio Berlusconi, a controversial billionaire who campaigned on ending the EU austerity in Italy. In Germany, Angela Merkel will soon face her own elections, where her popularity will be tested by opponents who will campaign against the continued funding of the EU by the German tax payers. Beppe Grillo has captured votes for his 5 star movement party by campaigning for a referendum on EU membership. Then there is France, a country somehow caught in the middle. The nation is central to the EU, its partnership with Germany gives the union its clout and its leadership with Angela Merkel helped lead Europe through the financial crisis in 2008/2009. But Francois Hollande won his presidency by promising policies like the 75% tax on millionaires and the lowering of the retirement age, while he has backed the periphery economies in talks against austerity (to the annoyance of Angela Merkel). The French economy is in desperate need of reform and cuts however. The budget deficit is set to go over the set target of 3% of GDP, public spending is the highest in the EU at 57% of GDP and while Germany’s economy has become more competitive over the last decade, France’s has been left unproductive in the global economy. President Hollande is now set to implement the austerity measures he never mentioned during his campaign and has since seen his popularity plunge to the lowest since the firth republic began. Showing the high public expenditure of France compared with similar sized countries. The contradictory aims of the different members are leaving the big decisions unmade. The lessons of the past bailouts are not being learnt; there is still no definite lender of the last resort, no banking union, no talks of the possibility of sharing out some of the debt across the union to help member states recover. Austerity is needed, but so are some pro-growth policies and just demanding more and more cuts from the bailed out countries is not going to get the right results. The EU budget could be restructured to help improve spending on much needed areas like infrastructure and reduce spending on subsidies like French Farming and the rebates that go to countries like Britain. Britain is another obstacle awaiting the EU in the future. The government is set to hold a referendum after 2015 (if it wins) on its EU membership and if the union is still facing the problems it is today, it is not inconceivable that the nation could leave the club. The public are already frustrated at the European laws they have to abide by and the levels of immigration that arrive to their shores. Losing Britain would be a deep blow to the union, both as the third largest economy and as a good balance to Germany’s motives. But the growing popularity of the UKIP party, again campaigning on an exit from the EU, shows the split that is appearing between member states. Together the EU is the biggest economic zone in the world, one which can rival the economies of the USA and China. Divided it is a bunch of quarrelling nations that can’t agree on the best policies to move forward. Right now the latter is a more poignant picture of the EU, with GDP retracting by 0.3% in 2012 and unemployment reaching a new high of 12%. Europe needs to integrate further both politically and economically if it’s reverse this slump. A move towards a banking union would be a good start, while sharing the debt burden of its weakest members would go a long way to restoring stability to an economic zone that has struggled with such a concept. A divided Europe is a weaker Europe, let’s just hope it doesn’t take its members too long to remember this. To buy or to not buy Blackberry shares? Research in Motion (RIM), better known as Blackberry, is a mobile and wireless company. It was founded in Ontario, Canada in 1984 and ever since, it has been exponentially dominating the mobile industry, until the sum of both Apple Inc. and the Economic crisis introduced itself into society. The preeminence of Blackberry was immeasurable, a certain design, a unique functionality, one of a kind messenger device for blackberry users and an alphabetical keyboard were the sole ingredients to make a product of international use and success. Blackberry initially commenced this new brand for an audience of adulthood; however it immediately gained recognition from multinational companies as a use of business phones. Blackberry was at its pinnacle in 2005-2007, every businessman had a blackberry in their hands staying fully connected to the company’s assignments in every corner of the world, but also it reached out into a new crowd as well which prospered the demand for Blackberry phones. Teenagers. Research in Motion established a market for high school students as it was a brand that displayed wealth and the Blackberry curves was the gem product for that age group, a phone cheaper and of less complicity, yet still retaining BBM and the blackberry software. Even though it was one of the highly expensive brands in the market; it’s Blackberry Messenger (BBM) and its developed internet software escalated the devices shares into a lucrative value. Its infinite amount of texting via BBM lured all teenagers: it became a platform of communication for students. The Blackberry device was epitomized with its easiness, designing elegance, speediness and originality of features. The brand shadowed intelligence, sophistication and maturity for blackberry owners, it developed a perception in developing countries that having a Blackberry became one of the means to portray upper class and wealth. Blackberry’s shares were very promising: it was obvious to go up in value more and more, until it got plagued by the sum of Apple Iphones and the European Crisis. Blackberry corporation shares were faltering and the devices became more tenuous with its crowd on the birth date of the one and only Iphone 3G. Shares immediately dropped and interest in the devices became less desirable. On top of the prosperous Iphone, the European crisis fostered Blackberry’s downfall. Blackberry stakeholders either instantly sold their shares or relied on faith; however selling was the more profitable of the two. Apple expanded the family by bringing the Iphone 3GS, 4, 4s, 5 and the demand was continuously sky-rocketing. Even though company’s transition from Blackberry’s to Apple products went substantially slow, small companies immediately transitioned towards the new investment of Apple. Blackberry was trying to rejuvenate by bringing out the Blackberry Torch, a phone consisting of both a keyboard and touch pad, however it was neither efficient nor reliable. On top of this defeat, the European crisis was a period of economic instability. A period which halted investments, advancements and disrupted economic growth and development. Apple and the Economic Crisis being the two factors, were the ones that illustrated Blackberry in a context laced with bankruptcy and sagging stock values. Is it the right time to buy Blackberry shares? Blackberry has finally taken the initiative to start a new beginning. They branched off from Research in Motion and developed a new scheme, a new start. They jumped back into the mobile industry with a new design for the Blackberry phones. Phones with more nuance and user-friendly. People are wondering whether Blackberry can build back the worldwide brand they had once established in 2006. Blackberry might have Apple and also Samsung against them, but they have planted their dominance in all corners in the world and it is a matter of time and innovation to re-plant and grow back their name onto soil. At the moment, it might not be the right time to buy Blackberry shares as it is at a fairly high price and there is a prospect of it devaluing. The corporation has a very adamant audience to convince, an audience to divert their notion back towards the Blackberry devices, however if people see Blackberry at a fairly low value, it might be appropriate to buy it. Why not? There are a new collection of devices coming into the market and it might play as the catalyst to more lucrative shares. 22. Keep the shares by visioning the long run, this plan would be highly profitable if the new collection of devices became a great appeal and see potential for the revival of Blackberry’s in companies that have switched to Apple products such as: Goodyear, ExxonMobil and TNT. Option two might seem risky, however Blackberry have played as the gem in the mobile industry and it is a matter of innovation and time to rejuvenate their once established international dominance. At the end of this year, immigration restrictions within Europe are set to relax, spiking fears in Britain that a mass influx of poor immigrants will arrive from the likes of Romania and Bulgaria. Britain has form, with similar circumstances in 2004 leading to a flood of Polish Citizens arriving in the country, to the point where Polish is now the second most spoken language in the country. This situation has lead to a growth in the popularity of UKIP, who campaign on restricting immigration and leaving the EU. Semi-Success in a by-election in Eastleigh, while rather meaningless in the grand scheme of things, has proved both their popularity gain and the unrest of the public. But are these fears well founded? UKIP take advantage of public discontent. Unhelpfully, there isn’t really any respected statistics on how many immigrants are set to hit the shores of the UK, while the government underestimated the numbers in 2004 and are wary to make the same mistake twice (with up to 13,000 projected a year but over quarter of a million arriving after the first couple of years) . A general estimate is that immigration from Romania and Bulgaria could rise to 50,000 a year for the next few years. But why choose Britain? The economy is spluttering along, the government is implementing tough austerity measures and the public already has a negative view of immigrants. In fact the government has been advertising this in the home nations, even going to the lengths of trashing Britain’s weather. Yet Britain remains an attractive location, with low unemployment when compared to the rest of Europe, a language spoke across the continent and a welfare system made famous by its generosity. Unemployment figures as of April 2012. However if the public is expecting a repeat of 2004, they will be mistaken. The factors are different now. Britain was one of the fastest growing economies on the continent back then and importantly was one of the few large economies to fully open their borders at the time. Now Both Romanians and Bulgarians have a much wider choice in where they can travel, meaning the immigration figures should be split between the different countries. In fact, Germany in an economic sense is a lot more attractive; they have more impressive employment figures and a more stable society (whereas Britain has suffered from riots in recent history). Additionally, while their movement has been restricted, its hasn’t been completely stalled, so many Romanians for example have already emigrated, while countries like Spain had already allowed unrestricted immigration prior to this. So while there will be an increase, it might not be as inflated as many are projecting. Either way, there will be more immigrants taking our jobs many will say. But that view is clearly wrong; many immigrants are either highly skilled and genuinely add something to the economy, or they are willing to do the low paid jobs many Britons would turn their nose up at e.g. picking vegetables. In fact, while locals grumble about the polish “invasion”, a reputation has spread of polish immigrants being hard workers, a term that isn’t coined so easily with British workers. But there are inevitably those that move into the country to take advantage of a welfare system that has seen benefits grow faster than average wage. This is the worst case scenario, with immigrants draining the system and sending money out of the country to families back home. But this is more rare than many think; labour participation is on average higher for immigrants than in the general population, while those that wished to move to Britain for such reasons could have already done so – the limitations have applied only to the labour market. In total, when comparing what immigrants have contributed with their costs since 2004 in the top eight European countries, immigrants have had positive effects on the country’s finances. Welfare cuts are being implemented now to help tighten the budget. If this wasn’t enough, the current government’s policies have not made the country very open or attractive to possible immigrants. The welfare state is being cut drastically; with benefit growth no longer being tied to inflation and a cap being introduced on entitlements to any family up to the average salary in the UK. While immigration in general is being clamped down on, with the government sticking to a target to reduce total immigration to fewer than 100,000 by 2015. David Cameron has gone about this by making it harder to obtain visas, which has unfairly fallen upon students, the sort of immigration that the country wants, young and skilled. But it has helped encourage an anti-immigration vibe in the public, where polls have shown a majority of the public wanting near zero immigration. Not that this would have an effect on immigrants from Europe anyway, unless the government was to radically defy EU law and start denying visas to such citizens. 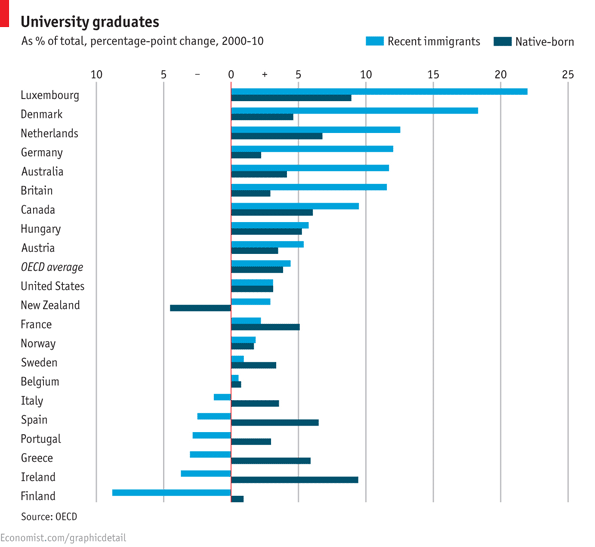 Growth in student immigration has been a strength of Britain’s. People seeking to rebut stimulus proposals often point to the example of small Baltic republic Estonia. This is the only Eurozone country to have deleveraged significantly enough to be called “Austerian”. Estonian Government Debt went from 7.2 percent to 6 percent of GDP, a remarkably high decrease. It also has a growth rate of 8%, not only one of the highest in the Eurozone, but also unique in the world. Austerity Advocates also seem to have their private-sector oriented rationale vindicated. Estonia is a strong producer of entrepreneurs, notably including the creation of the worldwide internet calling sensation, Skype. They are also unhindered by government bureaucracy, red tape, etc. Therefore,this should surely be an example which indicates the efficacy and the desirability of austerity policies. However, there are several chinks in the armor of that explanation. Firstly, Estonia made significant use of EU Structural Funds, borrowing 3.4 billion Euros (approximately 20% of Estonian GDP in 2011) during the years 2007-13. Now, in whichever way the government uses this money, it is effectively a Keynesian demand-side solution. In the Estonian case, however, the funds are supposed to be used to create more jobs in the entrepreneurial sector.This would therefore increase real incomes, therefore increasing consumer spending, pushing the economy forward. Now, there are people who argue that Government spending does not push the Economy Forward. In the case of Estonia, however, it undoubtedly did do so. Historically, from 1995 until 2012, Estonia GDP Growth Rate averaged 11.6%, reaching an all time high of 4.80 Percent in March of 2000 and a record low of -5.90 Percent in December of 2008. The Estonian Economy began recovering at the start of 2009. Funnily enough, Government Spending began to kick in at the end of 2008, a month or two around the trough of the recession. Considering that Government initatives have a month or two to take effect, Estonia’s boom is more coordinated with a rise in Government Spending. Second of all, Estonia is more export driven than any other Eurozone Economy, with 98% of it’s 2011 GDP coming from Exports of Goods and Services.This naturally means it is more dependent on foreign demand than any other of its European neighbors. One can conclude that largest catalyst that made these austerity measures work, was Estonian’s willingness to take on the hard measures needed to adopt these “belt-tightening” policies. For example, civil servants in Estonia took a 10% pay cut and ministers aswell saw 20% of their income cut. Pension age was raised, benefits cut, and job protection reduced, which points out that Estonia has unanimously accepted that times of lavish spending has finished, even the finance minister of Estonia has said that the people “understood they had to give up something”. The European Union (EU), an economic union between 27 member states in Europe, has recently suffered its first serious setback since its creation, termed as the “Euro Crisis”. Various members of the eurozone have been found to have serious debt problems which have affected the rest of the EU as they all share a single currency, the euro. But as Verhofstadt (2011), the former Belgian prime minister said “A state can exist without a currency, but a currency cannot exist without a state”. In this essay, I will discuss whether the euro was in fact doomed from the start from structural and unforeseen problems. First a short history of the euro will fill in any background information for this essay. Then the problems that will be considered are; the monetary policy problems, fiscal policy problems, a lack of preparation for any crisis, the lack of a real political union and a lack of equality throughout the EU. I will also explain reasons why the EU has been beneficial to its members including; the growth experienced before the crisis and the safety net the EU provided for the now failing economies in eurozone. The Mundell Fleming model will also be used to help show the different effects of both fiscal and monetary policies. The euro first came into existence in 1999, though the physical representation of the money wasn’t fully circulated until 2002. Important institutions for the EU are; the European Commission, the European Council, the Court of Justice of the EU and the European Central Bank which decide important decisions within the EU like legislation, European law and interest rates for the eurozone. Entry into the EU was regulated by the Maastricht treaty which stated any nation that wished to enter must pass certain fiscal criteria; inflation must not be 1.5% higher than the average of the three best performers, the budget deficit must not exceed 3% of GDP, government debt to GDP ratio must not rise above 60%, long term interest rates could not be 2% higher than the three lowest members and the applicant should have mirrored the domestic currency to the euro for two years without devaluating currency. Greece famously did not originally meet these criteria and weren’t allowed to join until later on, while the UK and Denmark decided against adopting the euro currency. In 2004, the eurozone expanded to include smaller nations like Cyprus, Czech Republic, Estonia, Hungary, Latvia, Lithuania, Malta, Poland, Slovakia, Slovenia and then in 2007 Bulgaria and Romania. Out of these nations only Slovenia, Cyprus, Malta, Slovakia and Estonia adopted the euro currency, while the other nations faced difficulties adjusting. Then in 2007/2008 there was a global financial crisis that pushed the eurozone into its first official recession in the third quarter of 2008, experiencing negative growth in the second, third and fourth quarters of 2008 and then into the first quarter of 2009. Greece suffered a crisis in confidence as international creditors started to doubt their ability to repay the huge debts they had acquired; with the debt to GDP ratio at a staggering 159% of GDP. This meant the eurozone countries along with the IMF had to bail out the country for the first time in May 2010, totalling €110 billion. This was followed by a second bailout this year of another €130 billion to help the country finance itself, while other countries like Ireland have also had to be bailed out. This has lead to a new European Fiscal Compact to be created that enforces nations to adhere to fiscal stability. This states that national budgets must either be in balance or surplus, otherwise punishments of fines of 0.1% of GDP and the loss of some of the countries fiscal sovereignty can be used. The first fundamental problem with the euro was that it was expected a single monetary policy for all the countries would work. The monetary policy, which controls the supply of money into a country by targeting interest rates, is controlled by the European Central Bank (ECB) in the eurozone. This means every country in the eurozone has to operate under the same interest rates, despite the massive differences between the economies of the central countries (Germany, France) and the periphery countries (Greece, Spain). Andre Szasz, a retired Dutch central banker, supports this argument, suggesting it was a mistake to have “a monetary policy of one size fits all” as interest rates will be “too low” for some countries and “too high” for others. This makes sense, as a country like Germany which produces a lot would be inclined to target low interest rates while a country like Greece which doesn’t produce enough would have higher interest rates. This led to the periphery states like Spain, Portugal and Greece being able to exploit the low interest rates that would not have been possible without being part of the euro. These low interest rates meant poorer countries could borrow money easily from international investors, not a big problem by itself, but when mixed with low productivity it encouraged nations to spend more money than they were making. This has lead to these nations building up vast amounts of debt that they cannot realistically pay back and with the financial crisis making credit scarce, these countries are finding it hard to obtain the loans they once found easy, with Portugal, Ireland and Greece being given junk credit status by credit rating agencies. This mass borrowing by the periphery nations (and Ireland) was good news for the central countries, especially Germany, as it meant new possible customers for their exports financed using money loaned from the richer nations like Germany: A vicious cycle. Zemanek (2010) supports this stating “Germany has experienced rising trade surpluses against the euro area countries starting from 2002 up to the recent crisis… other countries have large current account deficits, thereby accumulating increasing stocks of international debt”. Bayumi and Eichengreen (1992) argued that the European monetary union could not be an optimum currency union. An optimum currency union is a region where a single currency would maximise economic efficiency, satisfying the criteria of; labour mobility, capital mobility, price and wage flexibility, fiscal transfers and similar business cycles. It is argued that the eurozone does not have price and wage flexibility, fiscal transfers or labour flexibility. Issing (2000) supported the lack of this last quality, arguing “dangers can be identified relatively easily. The most obvious one is the lack of flexibility in the labour union… this poses an almost lethal threat to monetary union”. A single monetary policy also meant individual countries couldn’t de-value their currency by printing. When the financial crisis hit, countries like the UK and USA were able to devalue their currency by printing more money, this helps boost exports and stop imports and can be an important tool in restructuring a countries economy. But countries like Greece and Portugal within the EU don’t have that option and therefore the only way to restructure their economy is through internal austerity; cutting wages and spending. The Federal Union (2011) wrote “British government borrowing grew from 29.7% of GDP in 2002 to 36.5% in 2008… Since August 2007, the pound has lost 20 percent of its value against the euro” showing the UK was fiscally irresponsible as well, but that they had the ability to de-value their currency and boost exports and therefore not have to adhere to severe austerity policies like their EU counterparts. The second fundamental problem of the euro was the fiscal policy of the EU. In contrast to the monetary policy of the EU, each nation has a separate fiscal policy which leaves a very mixed economic structure for the EU. The fiscal policy refers to the government expenditure (e.g. new roads) and the collection of revenue (taxes) which affects the economy of the country. White (2011) suggested that it was “impossible to completely separate fiscal policy from monetary policy as central banks can prop up government bond prices by monetising debt” meaning the central banks of countries can buy up the debt of the country (though it is illegal to directly buy the debt, it can easily be bypassed) to help increase the supply of money, therefore affecting the monetary policy. The Mundell-Fleming model (an adaptation on the IS-LM model) helps shows the relationship between a country’s interest rates, output and nominal exchange rates. The model argues that a country cannot simultaneously achieve a fixed exchange rate, free capital movement and an independent monetary policy. The EU for example has flexible exchange rates and instead decides to target interest rates and free capital movement. The model shows; the IS curve: Output = Consumption + Investment + Government Spending + Net Exports, the LM curve: Money supply/Price = Liquidity preference (Interest rates, Output) and the Balance of Payments curve: Current accounts (Net Exports) + Capital accounts (Cash Flow). The EU uses flexible exchange rates, which means the European Central Bank allows exchange rates to be determined by market forces alone. With flexible exchanges rates, the central bank can increase the supply of money to try and boost the economy (Monetary change). This causes the LM curve to shift to the right, thereby increasing output and lowering the domestic interest rate in comparison to the global interest rate. This depreciates the local currency, making local goods more attractive and thereby increasing net exports. Increasing net exports shifts the IS curve to the right as well, up until the point where the balance of payment is equal again and the domestic exchange rate equals the global interest rate. But while this returns to normal, the GDP increases once again, meaning any increase in the money supply doesn’t have an effect on interest rates in the long term, but does increase the GDP of the country and vice versa for a decrease in the supply of money. The European Central Bank increases money supply through Quantitative easing, where it prints more euros for all the countries to help boost the economies that are underperforming. Too much quantitative easing can be bad for the economy, leading to a poorer standard of living, bad reputation with foreign markets and even the risk of hyperinflation, while the ECB has to try and balance out whether quantitative easing would benefit all the countries in the eurozone. Another option with flexible exchange rates is to increase government spending (fiscal change), this causes the IS curve shifts to the right, causing an increase in GDP and in the domestic interest rates compared to global interest rates. This leads to the currency appreciating, making foreign goods more appealing and decreasing net exports. This shifts the IS curve back to its original position where domestic interest rates are equal to global interest rates and has no impact on the LM curve. This means if there is perfect capital mobility, then an increase in government spending has no impact on GDP and vice versa with cuts in spending. This shows that both the fiscal and monetary policy are integrated and cannot just be separated like the EU have tried to do with the euro. A fiscal change with floating exchange rates graph shows what happens when government spending is increased (or taxes are decreased). A monetary expansion with floating exchange rates shows what happens when the supply of money is increased. The EU also had to make an assumption that with interest rates fixed and a single currency, each country would be fiscally responsible. That assumption was proven badly wrong, as a lot of countries used low interest rates to borrow irresponsibly without having the output to support such loans and built up uncontrollable amounts of debt. Marian Tupy (Legatum Institute) argued that “Greece’s membership in the eurozone allowed the Greek government to borrow at lower interest rates, and thereby enabled its overspending” showing the allure the EU created for poorer nations to borrow beyond their means. A new fiscal compact has recently been agreed between the countries in Europe (as described previously), with the UK and Czech Republic notably opting out of the treaty, which has the aim of stopping states running huge debts. This new fiscal compact shows an original problem with the structure of the EU, that regulation of fiscal activity in the eurozone was too relaxed. Dominguez (2006) came to this conclusion in her paper, writing “In 2000, one year after the euro was launched, five of the eleven countries in the eurozone were in violation of the public debt rule”, she then added “In 2005, the three largest eurozone economies – France, Germany and Italy – were out of compliance with both the budget deficit and public debt rules”. Another fundamental problem with the euro was that it seemed totally unprepared for a crisis. As the Economist captured perfectly “the designers of the good ship euro wanted to create the greatest liner of the age. But as everybody knows, it was fit only for fair-weather sailing, with an anarchic crew and no life boats”. The European central banks main purpose was to keep inflation low, not deal with any potential credit problems which it had neither the financial nor political power to accomplish. David Cameron (British Prime Minister) argued that successful currency unions have a lender of last resort, fiscal transfers, collective debt, economic integration and flexibility to deal with shocks, suggesting “currently it’s not that the eurozone doesn’t have all of these, it’s that it doesn’t have any of these”. Looking at the EU structure, it is easy to see what he is saying; countries are unable to transfer funds to struggling regions (e.g. Germany couldn’t transfer funds to Greece), debt is split unequally between different countries despite all using the same monetary policy, economies are kept largely separate with trade barriers still existing and there is absolutely no flexibility to deal with shocks as the financial crisis showed. Stelzer (2012) wrote ”Nor does Europe have a seamless method of transferring income from flush to stricken areas. America does: cash flows automatically to troubled states with falling tax receipts and rising welfare costs, from states doing better” which shows the one reason how America have been able to bounce back faster than the eurozone, because they have been able to transfer funds to poorer regions and have spread the debt collectively over all the states. But the most important of these factors is arguably having a lender of last resort, some sort of institution that can bail out the government if they can’t pay its debt. The USA has this in the form of the Federal Reserve, which can provide funds for any of the states if they require it. One of the main problems of the euro crisis was a lack of liquidity; this should have been the role of the European Central Bank as a lender of last resort. Instead the EU had a rule of no bail outs, relying on markets to keep a government from acting fiscally irresponsible, which has now backfired as the EU has hurriedly created a rescue fund to help solve a liquidity time bomb. The rescue fund created has little use however as it is massively underfunded, unable to bail-out a country the size of Italy for example. Without the ability to bail out countries, the EU could break up, a topic politically avoided. Ulrike Guerat of the European Council on foreign relations expresses fear in his paper that rather like the Soviet Union, the EU would go down quickly if the euro started to break up, showing a general worry that if a country like Greece (in the worst condition in the eurozone) defaults on its debt and leaves the euro, it could have a domino effect on the rest of the EU, with Portugal and Ireland very vulnerable to any shocks in the market. An additional structural problem with the euro was that there wasn’t a political union. George Soros (2011) stated “the euro is a flawed construct “by which he meant the euro needed a stronger political union behind it. He then went on to suggest a single-pan European Union welfare state would allow for the creation of one fiscal and monetary policy for all of Europe. The EU faces constant bickering from different members over different policies, and struggles to achieve a united front at times. One such example was with foreign policy, where the UK and France agreed to intervene in the conflict in Libya, while Germany decided against joining in, showing that a conflict in interests can divide the eurozone. The United States of America is a good body to compare the European Union to as it shows the difference of being united politically. The Economist supports this argument, stating “America created political union followed by a fiscal union. But Europe is doing things backwards, creating the euro in hope of fostering political union”. EU policy has long been seen as being dominated by the central nations, with Germany suggested as having a lot of sway in the decision making process. This has stemmed from EU policy benefitting Germany before the crisis; as a weak currency meant they could export their goods more easily and low inflation was suggested to be focused on strongly because of German fear of hyperinflation, indeed the European Central Bank’s main policy is to control inflation. This has been resented by the periphery nations which feel they are not represented in EU policies. The EU parliament has long been an institution with little power, with the economist describing it well, suggesting they measure “themselves against America’s congress without having its means” meaning that unlike Congress, they have little sway in uniting different countries inside the eurozone and although it can decide how to spend the EU money, it cannot dictate how it is raised. The EU parliament gained mores powers in 2009 after the Lisbon Treaty to monitor national budgets but any decisions have to be debated between two other bodies; the European Commission and the Council of Ministers while all the major topics like education and health are decided by national governments. This sort of system keeps the different nations separate and makes decision making a long and tedious process. The German Chancellor, Angela Merkel, has spoken of a potential “political union” for the EU with a strong parliament, showing the lack of one originally has been realised as a mistake by the leading figures of the EU. The final structural problem found with the euro was the lack of equality throughout the EU. There is a vast difference between the economies of the central nations and the economies of the periphery nations. Germany has been a highly competitive saving nation since the euro’s creation whiles the “PIIGS” countries (Portugal, Italy, Ireland, Greece and Spain) were the complete opposite; uncompetitive in production and too reliant on credit to finance themselves. This meant the capital flowing into these countries created a wage boom which saw wage growth rise above productivity growth, while Germany’s wage growth remained moderate meaning they could remain competitive over their rivals. A rigid labour market meant that when the financial crisis hit, real wages couldn’t adjust quickly enough in the periphery states, which coupled with an inability to devalue their currency led to a deep recession for these countries. Rogoff (2012) argued that the lack of labour mobility in the euro was a big problem, suggesting “if intra-eurozone mobility were anything like Mundell’s ideal, today we would not be seeing 25% unemployment in Spain while Germany’s unemployment rate is below 7%” meaning the eurozone is not one of Mundell’s optimal currency areas. Zemanek (2010) produced some facts, saying “while Germany and Austria broadly kept unit labour costs at the level of 1999. In Iceland, Portugal, Spain, Greece, Italy and the Netherlands unit labour costs have increased significantly – by up to 30% compared with 1999” showing how competitive Germany had become compared with most other countries. This inequality throughout the eurozone has destabilised the EU, leading to hugely contrasting current accounts; with Germany having a big surplus and Greece having a large deficit. We can use the idea of an optimal allocation to show the problems with inequality in the eurozone. An allocation (consumption of an individual in an economy) is only an optimal allocation if it is both efficient and equitable. We can judge efficiency by using the idea of Pareto efficiency: that no-one can be better off without making another individual worse off. A lot of allocations can be pareto efficient but still be unfair however, for example if one person has 7 apples and another 3 this would be considered pareto efficient. To make the allocation equitable, it needs to maximise social welfare (benefit society). A good model to show this is the Utilitarian model, which shows an economy of two individuals, where a UPF curve shows the pareto efficient utilities of both consumers and the social welfare function curve shows the point on the previous curve where the allocation is both pareto efficient and equitable. In the case of the EU, the redistribution of endowments in the market is the responsibility of the EU government and they haven’t done this effectively, as the imbalances between different countries shows. Germany is highly productive, export more than they import and have high employment, this is in contrast with Greece where they import more than they export, have high unemployment and have low productivity. The EU needs to fix these sorts of problems, where jobs are available in some areas of the eurozone and non-existent in others. They could do this by producing more public sector jobs in areas that have low unemployment or improving infrastructure to attract private industry, but this will be hard as countries in the eurozone still have individual governments (not in the EU’s power) and political mistrust between countries will interfere in the sharing of resources e.g. Germany are unlikely to agree with strengthening their rivals in the market. A more unified European Union, as discussed in earlier points, in the shape of a real political union could help different countries become more equal in the EU. 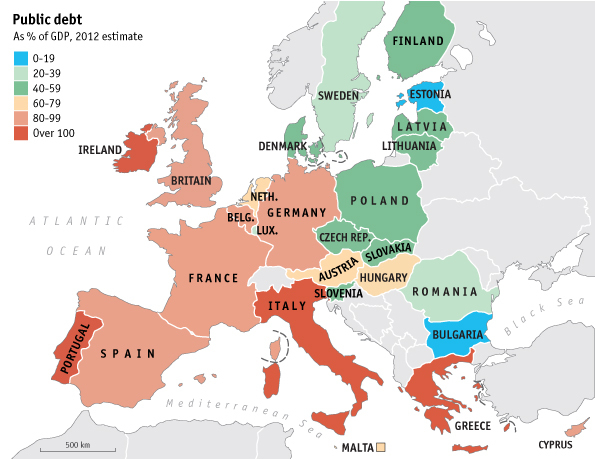 Map showing the different debt to GDP ratios of the countries in the eurozone. This shows the contrasting levels of debt in the eurozone; with Greece, Italy, Portugal and Ireland in much worse positions than France and Germany. This inequality is bad for the EU and a collective measure of the debt would help sort out these issues. (Economist, 2011). However, it cannot be said that the euro was all bad. Most of the countries that joined the EU experienced big growth in the period up to the crisis. Yannos Papantoniou (2011) found that in the years 1999-2008 compared to 1989-1998, the eurozone countries experienced; 1% lower unemployment, 1.1% lower inflation and GDP growth of at least 5% each year (excluding 2003). The periphery nations like Spain and Greece experienced big economic growth (with Greece growing larger than the eurozone in 2003) which has seen their standard of living for their people improve greatly. During this period life was good for those nations, despite it being financed by debt, and their business sectors and infrastructure were upgraded in the process. Having the same currency also meant countries could trade with each other much easier without the need for different exchange rates. The euro has benefited businesses in Germany and France (whose main customers were in Europe) and tourism for countries like Greece and Spain (whose economies rely on this sector) as there were no longer any transaction costs for each country and made prices in each country relatively equal and transparent. Also it is comparable to look at Iceland who possesses a single currency and has had troubles with volatile exchange rates due to changes in the market. This shows the problems that each country could still be facing if they hadn’t been part of the euro; highly vulnerable to any changes in the world market like rises in oil prices or commodity prices. Papantoniou (2011) supports this stating “the growth of output seems to have been stabilised in the euro area since the end of the 1990’s. Although the eurozone has not been the only area enjoying this decline in volatility of output growth, the convergence of economic policies of the eurozone countries coupled with a steady monetary policy of the ECB in its response to major events, such as the global economic downturn in the early 2000’s”. By employing data over 1982-2002, De Sousa and Lochard (2005) found that the euro has raised flows of foreign direct investment within the euro area by 62%. Another benefit of the euro has been the safety net that each nation in the eurozone now possesses. Since the euro crisis, Greece and Ireland have had to be bailed out by the EU and IMF, this wouldn’t have happened had they not been part of this union that they can fall back on. The EU can’t afford to let any nation default as it could trigger a domino effect, so all the countries in the eurozone will continue to help bailout any countries in need to stop another crisis. Also, though countries like the UK do have the option of de-valuing their currency that members of the euro don’t have, it does have negative effects. The Federal Union website supports this stating “devaluation leads to reduced living standards, higher inflation and creditors deprived of full repayments abroad” with the last factor leading to countries losing their credible reputation with foreign investors. White (2011) reiterated this stating “For the citizens of an open economy who want to enjoy cross-border trade and investment, and want to have a trustworthy currency, the option of their central bank to devalue carries a near zero or even negative value, while the benefits of membership in a common currency area are important and positive”. He went on to suggest “The euro has so far held its value better than the drachma or the lira or the peseta used to” meaning the countries in the eurozone could have been much worse off had they not shared a currency and seen their economies lose their value. Tilford (2012) suggests that the EU compares favourably with its rivals, stating “Eurozone members as a whole … have a lower budget deficit than the US and the United Kingdom, and a similar level of public debt. Unlike the US and the UK, the eurozone in aggregate is running a current-account surplus” though the problem is whether to perceive the EU as a single organism or a host of multiple countries. The economist also found that “Prior to the crisis, Italy’s government was running a primary surplus and bringing down its debt-to-GDP ratio. So long as markets were prepared to finance Italy’s old debt at low rates, it was in good shape. Now, of course, markets aren’t prepared to do that” showing not all the nations now in trouble were spending outrageously, it’s just that once markets were spooked it effected some fragile economies in the eurozone like Italy. The European Central Bank also managed to keep its inflation rates at low levels throughout the euro (at around 2%), an important step in making sure a problem of hyperinflation didn’t spread through the eurozone. In conclusion, the euro has some fundamental problems that need to be solved if it is to survive. The first two problems are interlinked, as the EU cannot have one monetary policy and multiple fiscal policies. The EU will need to either centralise the fiscal policy of the eurozone, giving more power to the EU parliament over taxes/government spending or give up some of its power over monetary policy and allow countries to print their own euros with some sort of maximum limit in place. The first choice seems the most likely as the EU continues along a current path of greater unification (bailing out countries to keep the EU in existence) and this could result in Eurobonds, as a way of reducing borrowing costs for each country and creating a safer asset for the EU. The current structure of the EU has political fractures between different governments, as countries fight for their own interests, this will need to be sorted by giving more power to the EU parliament and getting rid of current trade barriers between nations. The vast inequality will need to be treated too, as contrasting statistics between central and periphery states (budget deficits, current accounts) will continue to split the EU. A solution could be to have a system like that in USA where the richer states can transfer funds to the poorer states; this is basically in use now in the eurozone as countries like Germany and France are being forced to bail-out their neighbours. The last fundamental problem of having no preparation for a crisis is already being resolved, as the recent Euro Crisis has caused countries to stop either living fiscally irresponsibly (Greece) or to stop relying on certain markets (Spain too reliant on construction market). There is also more regulation over fiscal activity and bank credit, which was badly missing from the original set up and encouraged nations to live beyond their means. The euro did allow growth in poorer regions of Europe, but this was financed by easy debt. While the safety net it now provides relies on the belief that the countries footing the bill will continue to decide the costs of bail outs outweigh the costs of a breakup of the euro. Instead there should already be a lender of last resort set up, the European Central Bank for instance, which can help out any country and already have been financed by years of savings from each country. 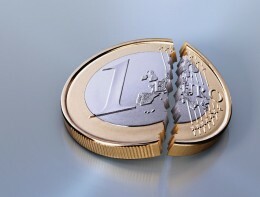 These points add up to suggest the euro was in fact doomed from the start due to innate problems in its structure and the only way it can survive in its current form will be through reforms in its monetary and fiscal policy and its political unity. My name is Kane Prior and I like to write about economic issues from around the World. I am a graduate from the University of Kent with a 2.1 degree in Business and Economics. I hope to use this blog to gain interest in myself and maybe lead to some potential career someday. If you want to contact me I am on Twitter (just click on the image) and if you have any writing opportunities for me, then please feel free to drop a message. The Brazilian Bubble Great economic insight into Brazil and other emerging markets. The economic forecast An excellent blog showing the economic issues that will effect you the most. The International Business and Economic Journal An interesting economics blog, home to a great variety of writers.